Camera360 app for Android devices just got updated to v5.3 with few new features. You can now register using individual emails. Everything is now working with better Cloud Album, Quicker app launch, smoother and faster photo taking experience. Published by PinGuo, Camera360 is the only photo-editing app you need. Enjoy endless editing effects and filters as you transform your mobile photos into gallery-worthy shots. 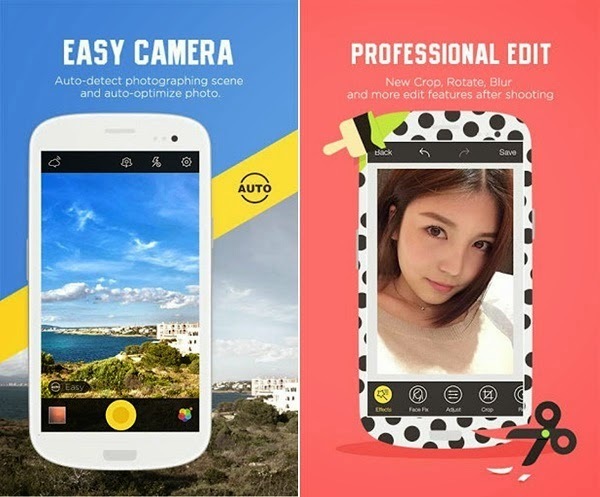 This app has a wide range of effects and modes that are useful in every picture that you take. You can Crop, Rotate, Blur, Texture, Adjust and more photo edit features are available after shooting. Camera360 is one of the better ones out there. Many useful features that work and free. It has very wonderful effects that allow you to make a lot of different shots for the same thing. Total control, awesome effects, smooth and reliable equals awesome photographs, giving you the sense of an Android like control on photography. I definitely recommend it to anyone who wants there are pictures to look beautiful.